I f you are looking for an old-fashioned Christmas experience, we invite you to come home to Old Town Montrose. Our family owned and/or operated shops, dressed up beautifully for the holiday season, offer unique gifts for everyone on your list- from pets to kids to family and friends! And when you need a break from shopping, our many restaurants, cafes and bakeries offer great choices for a quick bite of lunch, a leisurely dinner, or just a bit of sugar to satisfy your sweet tooth! SHOP & DINE in the Montrose Shopping Park surrounded by millions of twinkling lights! On Nov. 23th to Dec. 23rd, Tree Lighting on Nov. 23, 2018, come enjoy an evening in Montrose with strolling carolers, Santa Claus and the annual Holiday Tree and Town Lighting ceremony at 7:00 pm. Our wonderful weekend traditions of horse drawn trolley and pony rides, strolling carolers, Christmas music and Santa Claus continue this year! The horse drawn trolley provides complimentary rides up and down Honolulu Avenue on Saturdays and Sundays. Free hand-led pony rides are available for the kids on Saturdays and Santa Claus can be seen strolling and handing out candy canes Saturdays and Sundays. There will be live Christmas music on the streets and an expanded Kid’s Zone in the Sunday Market that includes a petting zoo! 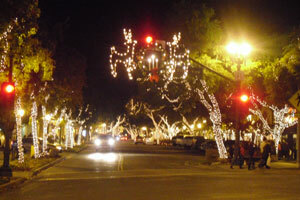 Leave the overcrowded malls and long lines behind and come spend the holidays in charming, old town Montrose. There’s plenty of free parking, wonderful shops and amazing food – truly something for everyone. Santa Claus – 12 p.m. to 3 p.m.
Free Horse Drawn Trolley Rides along Honolulu Avenue – 11 a.m. to 2 p.m.
Free Pony Rides – 11 a.m. to 3 p.m.
Montrose Harvest Market with Ponies & Petting Zoo – 9 a.m. to 2 p.m.